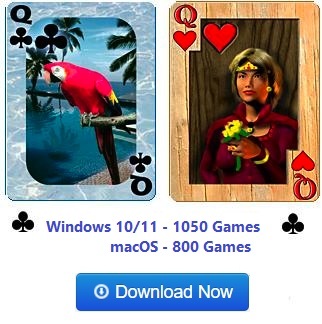 Screen shot of the game FreeCell Twice from Pretty Good Solitaire. 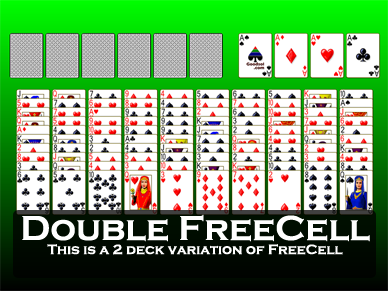 FreeCell Twice is a two deck FreeCell game, similar to FreeCell Duplex. The object is to build all the cards to the foundation piles. There are eight foundation piles, across the top. There are six cells (top left corner) which begin the game empty. There are 12 tableau piles. At the beginning of the game, nine cards are dealt face up to the first eight piles, and eight cards are dealt to the remaining piles. All the cards are face up. The tableau piles are built down by alternate color. Move groups of cards if they are in sequence down by alternate color and if there are enough free cells that the cards could be moved individually. Spaces can be filled by any card or legal group of cards. In short, play is exactly like FreeCell. 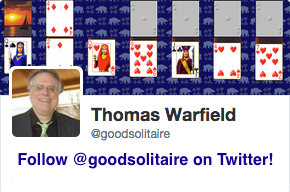 Like many FreeCell variations, FreeCell Twice is likely winnable almost all of the time. 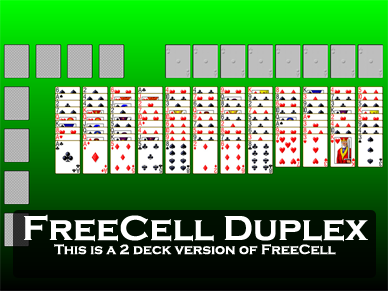 With two fewer cells than FreeCell Duplex, it will be considerably harder than that game.